Built this site to explain the steps and applications used to create Web-based and Computer-based training. Built this site to display and promote the books I edited, co-authored, and published for Jerry Matney. Built for Bob to explain how he grows and decorates his gourds in Moab, Utah. Site includes many gourd photos plus tips for cleaning gourds. Built to promote the correspondence courses offered by this school. I edited all the course materials, rewrote several of them, and handle the online division. 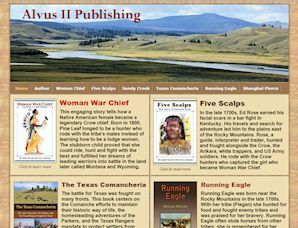 Built this site to promote a Native American historical novel that I co-authored. Built in 2005 after my son Eric passed away. The site contains four Flash movies, created from numerous photos. 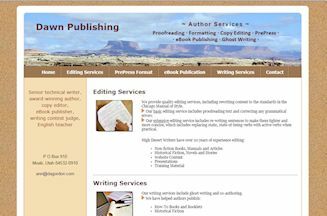 Built to promote Author Services, including writing, editing, pre-press, eBook publishing, and ghost writing (website under re-construction).